Nice work on the various details; I like the baskets (and the tip about having an odd number of uprights). That netting looks to be the same material as I used for the hammock cranes on Vanguard - useful stuff! Great job on the details and the rigging looks very realistic. Well I have been working so much, but finally had a little time to get back to my little boat. Well the display case is almost done. All that is left is to cut the plexi-glass, sand finish the edges and weld them together. The Sea of Galilee Boat also known as the "Jesus Boat" was an ancient fishing boat from the 1st century the time of Jesus Christ. discovered in 1986 on the north-west shore of the Sea of Galilee in Israel. The remains of the boat, first appeared during a drought, when the waters of the Sea actually a great fresh-water lake receded. The remains of the boat were found by brothers Moshe and Yuval Lufan, fishermen from Kibbutz Ginnosar. The brothers were keen amateur archaeologists with an interest in discovering artifacts from Israel's past. It had always been their hope to one day discover a boat in the Sea of Galilee, where they and generations of their family had fished. When drought reduced the water-level of the lake, the two brothers examined the newly exposed beach and stumbled across the remains of the boat buried in the shore. 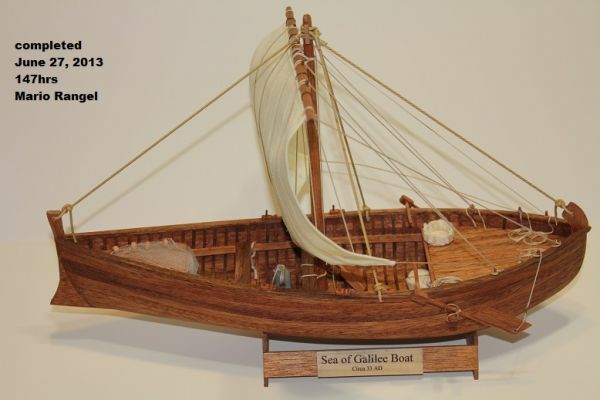 The Sea of Galilee Boat is historically important to Jews as an example of the type of boat used by their ancestors in the 1st century for both fishing and transportation across the lake. Previously only references made by Roman authors, the Bible and mosaics had provided archeologists insight into the construction of these types of vessels. The boat is also important to Christians because this was the sort of boat used by Jesus and his disciples, several of whom were fishermen. Boats such as this played a large role in Jesus' life and ministry, and are mentioned 50 times in the Gospels, though there is no evidence connecting the Sea of Galilee Boat itself to Jesus or his disciples. The archeological discovery of this boat had validated certain questions that we had about this vessel. 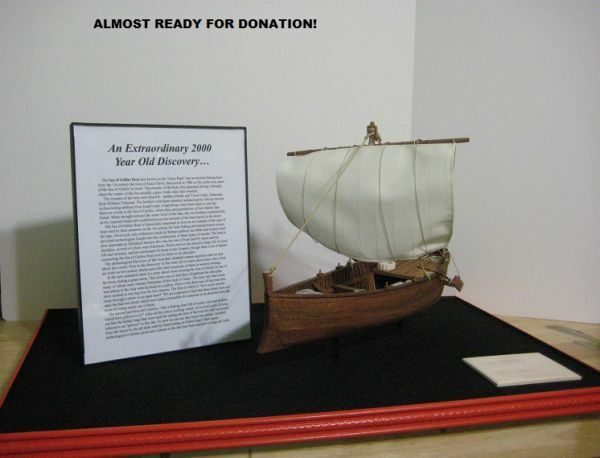 Prior to the discovery of this boat, all we knew about them came from art work on few pottery shards and a few brief mentions of them in ancient writings. In the new testament there is a story about Jesus crossing the Sea of Galilee in one of the boats during a great storm. This storm was so bad that it frightened the disciples, many of whom were veteran fishermen of this body of water. The story says that Jesus was asleep in the boat with his head on a pillow. Prior to the discovery of this boat this story seemed to not ring true for two reasons. The first of which is "how could anyone sleep through a storm in an open boat?" We are surprised to find that these boats were not open but had two decks which now makes it possible for someone to be shielded from the storm by being under one of them. The second question still remains, "why a fishing boat full of scales, nets and baskets would have pillows in it?" After all this was a working vessel, not a royal yacht. It turns out that the ballast bags that were used for setting the trim of the boat are still commonly referred to as "pillows" to this day. So now we can see that Jesus was asleep, shielded from the storm by the aft deck with his head resting on ballast bags! Once again archeological evidence gives new witness to the fact that these ancient writings are valid.